For the last several years, I’ve tried to make a name for myself in the internet business education space in the same vein that Pat Flynn, John Lee Dumas, Jaime Tardy and many others have. The idea is that by branding oneself as an expert in the space, one can build an audience, sell digital products to that audience, make money by recommending products and services to that audience, generate royalties from books, and get paid speaking gigs. Pat Flynn has done this arguably better than anyone. He created a few income-generating websites and used that experience and his charming personality to build a seven-figure internet business primarily by selling products and services to his audience. For a while, I thought this was a natural next step for me. 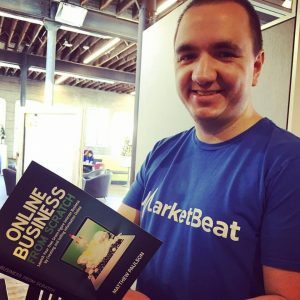 I turned MarketBeat into a fast-growing and very profitable business and thought it would be feasible to build a personal brand and digital products around that success. To build a personal brand and establish myself as an internet business expert, I published eight personal finance and internet business books. I briefly hosted a podcast called Startup Q&A. I’ve written hundreds of articles, built up a five-figure following on Facebook, been interviewed on podcasts dozens of times, attended five or six conferences each year and even won a couple of business awards. I worked hard to establish the “Matthew Paulson” brand and even had some moderate success by generating $4,000 to $8,000 per month in book royalties. Over the course of the last six months, something changed inside of me. I realized that I didn’t really enjoy the work, didn’t have the right personality to be a “guru” and didn’t really want to be part of the chorus of internet business celebrities. By pursuing this dream of being an internet business expert, I was frankly trying to be someone that I just wasn’t. I was pursuing someone else’s dream. I don’t crave the limelight that comes with being an internet business guru and I don’t care if the world knows who I am. Having one million people follow me on Twitter just doesn’t do anything for me. I’d rather be the guy working quietly behind the scenes, creating wealth, taking care of his family and doing some good in his small corner of the world. Yes, I love creating content that helps people build businesses and achieve financial freedom. That will probably never change. However, I don’t really like the idea of trying to make money by being yet another internet business expert and being forced to keep pushing out new content to keep my business going. I’d rather make my money from my business (MarketBeat) and create educational content in my free time knowing that I am genuinely helping people without asking for anything in return. I will certainly keep writing and publishing content when I feel I have something valuable or helpful to say, but I won’t be pushing out content for the sake of pushing out content. So, what does this all mean? You probably won’t be seeing me doing many podcast interviews in the future. There probably won’t ever be a “Season 2” of Startup Q&A and I probably won’t be publishing another book until I identify a topic that I can’t not write about. I won’t be seeking speaking opportunities at conferences or putting a ton of effort into building a personal brand online. This may disappoint those of you that have really enjoyed my content, but it will free me up to work on projects that are more important to me and the world around me. I have probably worked less in 2017 than in any year in recent history. I am not working on any new book projects, am in the process of negotiating an exit from my ownership stake in USGolfTV, have stopped podcasting and have brought on some additional help at MarketBeat. By cutting out these projects, I have been able to spend more time with my lovely wife, five-year-old son and my one-year old daughter. I’ve had time to relax and enjoy many of the simple pleasures of life that I had set aside while building my business empire—watching television, riding my bike, reading fiction books, etc. I have also been able to “double down” on MarketBeat. Toward the end of last year, the business had plateaued and was even beginning to decline because I hadn’t kept up with changing industry trends and I hadn’t found anything to make up for a key marketing strategy that wasn’t working as well as it used to. I’ve done a lot of work this year to turn the company around. Our team has tested several new marketing strategies and revamped many aspects of our core business. Because of these efforts, I am happy to report that it will grow by between 15% and 20% over last year. Finally, I have been able to pursue my new passion of building a local entrepreneurial ecosystem. I created a very successful Facebook group for entrepreneurs in the Sioux Falls area. I’ve hosted a number of local events, have been helping out the Zeal Center for Entrepreneurship with a variety of initiatives, have been helping run 1 Million Cups, and continue to run Falls Angel Fund. You probably won’t be seeing me headline a major internet marketing conference or at the top of the business section on the Kindle store anytime soon, but I will be a well-rounded husband and father that runs a profitable online business and does some good in the world. Take a moment and consider what you are working toward. Are you following your dreams and your passions? Or, are you trying to be what your parents, your spouse or other family members expect you to become? Are you still doing things that used to make sense but are no longer important to you? Are you putting effort into side projects that just aren’t going anywhere? Is there something in your life that you wish you could give more time to, but can’t because of your other commitments? Really consider where your best time and energy are going and make sure those efforts are in alignment with your dreams, passions and interest. Your post was refreshing. I love helping people, but trying to turn my love into an affiliate marketing business is working against my natural spirit. 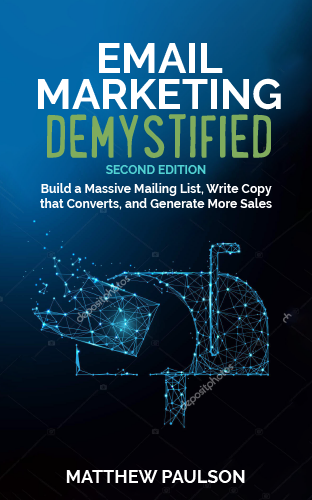 I personally am annoyed when I receive sometimes daily emails from marketers using their email funnels. I dislike web pop-ups that distract me from reading the articles I clicked on. I understand the marketing techniques that are being used when I visit a site. I respect that people are working hard to monetize their sites, yet the techniques are so annoying (and EVERYONE is using the same ones). What I am looking for is a way to generate revenue without having to use the marketing techniques that I don’t like. I’m not sure what the answer is, but I will keep looking. Please leave your Business Q&A videos up as they do have a lot of great information. I won’t be deleting them. This speaks to me. Thank you for sharing! It takes a lot of courage to write a post such as this and even more to stop, reflect on your life and turn it around completely by leaving projects and a past dream to focus on what really matters and is important to you now. We should always focus on being ourselves, the best version of ourselves and that’s the secret to be happy. Hey Matt! I think you’ve helped me realize that I’m kind of in the same boat as you – except that I haven’t put forth nearly as much effort as you obviously have… I’ve never wanted to ‘be’ the next Pat Flynn, per se… but with a domain like DumbPassiveIncome.com – I am obviously making a feeble attempt to emulate him in (at least) a small way. It’s awesome that you’ve had your own realization moment and shared it publicly. Good stuff man! And really well written. Now I wish I’ve been around to read more of your stuff when you were trying! Looking forward to following your journey as you seem to be heading down the right path. Excellent post and what sounds like an even better decision, Matt. Thanks for sharing. It’s great that you are putting more time to where it really matters; with your family! I wish you continued good luck. Wow brave adn wise of you. I have heard your name and was in fact just floating back to your ecosystem. But I totally get the hamster wheel of “branding” and esp in the internet marketing field. Kudos for being honest with yourself for your life and your family’s best interest! This is most impressive! A rebalancing with focus on building your community. This is such wise words. What is life if you do not enjoy it, live for your passions and have time to enjoy it? It is one thing to chase the money and another to live a full life. To be at a place that many dream to be at but realising how precious time is and simply stop, turn around and work towards happiness, takes courage.